For Chrysler vehicles from 1990-2003. 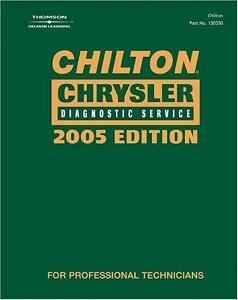 The Chilton 2005 Diagnostic Service Manuals are designed for technicians with a high-level understanding of OBD-II. They provide technicians with the critical diagnostic information they need to accurately identify and solve engine performance problems. Clear explanations, specifications, and illustrations help technicians diagnose secondgeneration on-board diagnostic (OBD-II) systems. Chilton Diagnostic Service Manuals, when used with an engine analyzer, scan tool, or lab scope, allow diagnosticians to gain a better understanding of engine performance components and systems, testing procedures, and the specifications necessary to determine faults. They fully explain system and monitor operation, aid diagnosis, and simplify repairs. Each manual contains hundreds of pages of Quick Reference ""lookups"" that technicians can refer to as they test and repair vehicles with On Board Diagnostics (OBD-II).